Understanding the kegerator parts and their operation is an important step to serving great draft beer. When you buy a kegerator, whether new or used, it may not come with any form of instruction or operating manual. There may be kegerator parts and equipment that you are not familiar with and do not know what a part is used for. Sometimes the simplest or most common things can be the most perplexing. Here we will try to provide an overview of a kegerator and its parts. Some of the equipment is described and explained elsewhere, but now we will look at where the parts fit and why they are there. This overview mostly covers what we call "store bought" kegerators as opposed to commercial models. These "store bought" models are commonly found in big box stores and online at other large retailers. Their most common features are the low relative price and the use of a "cold plate" as the element for cooling the appliance. These kegerators also have in common some problems that you can read about here. This is a general discussion that we will try to make as complete as possible. However, your kegerator may not have all the same parts in all the same locations so there is some variety among brands and models. 1. Casters - Wheels for a mobile kegerator. Having wheels is a good idea especially if your kegerator has the gas cylinder mounted on the back. 2. Interior Floor Support - this is a must have item even if you have to build one yourself. It will protect the interior lining of the floor from damage caused by sliding kegs in and out or dropping keg couplers, etc. This is usually a piece of aluminum sheet cut to fit. If you have to build one, plywood would do if it is waterproofed with epoxy or other coating. 3. Cabinet or Keg Box - the keg living area. This is the refrigerated area the keeps the beer cold and holds some of the key components of your draft system. The box is usually built with a metal exterior, plastic interior and a layer of foam insulation in between. 4, CO2 Cylinder and Regulator Assembly - these are the active components of the pressure side of your draft beer system. Some brands will have the assembly mounted inside the cabinet others will have is mounted to the unit's exterior. 5. Cylinder Bracket - a very important, but often overlooked part. The bracket secures the CO2 cylinder, preventing it and the regulator from falling over and being damaged or broken, a situation that could be very dangerous. Some brands will have a metal bracket that mounts to the interior wall and secures the cylinder with a bolt and nut tightened around the cylinder. Others will have a light chain that wraps around the neck of the cylinder and is secured by eye-hooks. A metal bracket is far superior to a chain. 6. Evaporator or Cold Plate - This is the part of the refrigeration system that resides inside the cabinet. The evaporator typically is a white, metallic plate with a pattern of tubes showing through the surface. The refrigerant flows through those tubes on its way back to the condensor as part of the cooling cycle. The evaporator will often collect ice, but must never be damaged by trying to pick or pull ice off the plate. A damaged plate will destroy the refrigeration cycle and ruin your kegerator. Learn more about how your kegerator's refrigeration works. 7. Drain Hole - located somewhere below the Cold Plate, the hole allows water that has condensed on the cold plate to drain away to the outside of the cabinet. The drain hole usually leads to a drip pan or collection tray that collects the water. 8. Shelf Brackets - many brands are convertible to standard mini-refrigerators with shelves. The brackets support the shelves. The brackets can be removed to provide a convenient place to drill a hole in the cabinet should that be necessary for inserting a gas line or electric components into the keg box. 9. Interior Lining - the cabinet's interior surface is lined fully with plastic that covers the cabinet's insulation and protects it from damage. The lining is easily punctured or otherwise damaged. Therefore, the lining on the floor of the cabinet is usually protected by the floor support. 10. Door Gasket - another very important part that gets overlooked often. The door gasket seals the cabinet closed, trapping all the cold air inside and keeping humidity out. A slight leak, tear, or misalignment of the gasket can seriously compromise the performance of your kegerator. The gasket is usually glued in place and can be re-glued if it is pulled off the door. If punctured or dry rotted the gasket will need to be replaced. 11. Thermostat - the switch that turns the cooling cycle on and off. The thermostat, using its associated temperature sensor regulates the temperature inside the cabinet. Some models will have the thermostat and sensor mounted together inside the cabinet while other brands have the thermostat mounted separately, outside the cabinet usually on the rear of the unit. Some have a fingertip operated dial to set the temperature. Others use a screw device. Any numeric markings on the face of the dial are usually relative indicators of the temperature setting and not actual temperatures. 12. Temperature Sensor - in many brands the sensor is mounted inside the cabinet separately from the thermostat. It will usually appear as a thick wire or metal tube in the vicinity of the cold plate. It is easily damaged and should not be touched. 13. Gas and Beer Lines - the vinyl transport system that delivers pressurized gas to the keg and beer to the faucet. 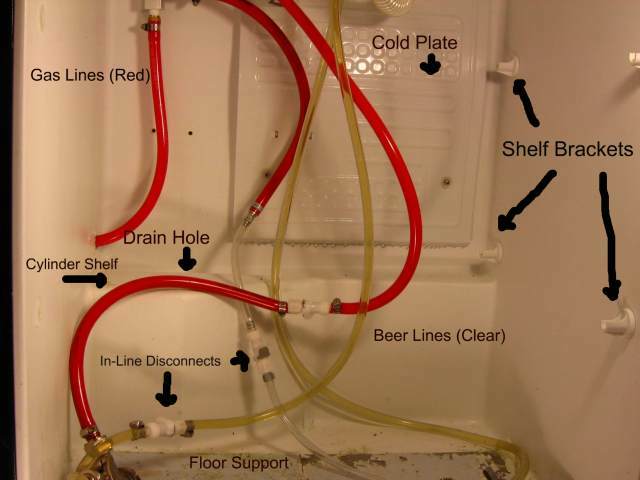 Gas lines are often colored (red) while beer lines are generally clear. Learn more about hose and clamps. 14. Keg Coupler - the vital link between the pressure and liquid systems with the keg. Learn more about keg couplers. 15. Condenser - This is the device that dissipates the heat absorbed by the refrigerant as it passes through the evaporator. 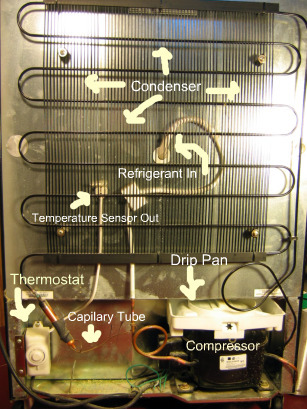 The refrigerant travels through the condenser's tubes as it cools. On most brands the condenser is placed on the back of the unit and resembles a cage placed a couple of inches over the outside of the rear of the cabinet. Learn more about how the refrigeration works. 16. Condensate Collection Tray - collects any water dripping off the evaporator during defrost cycles. This water drains out of the cabinent through the drain hole and into the tray. The tray on many brands is mounted above the compressor and uses the heat generated by the compressor to evaporate the water into the atmosphere. This action eliminate the need to dump the tray. Some models use a small fan to facilitate the evaporation of the collected water. 17. Work Top - is the horizontal, exterior surface of the cabinet where the draft tower and drip tray are mounted. The work top generally has room for storing glassware and other items. It is often constructed with particle board laminated with a plastic surface much like a kitchen counter. This type of work top is easy to drill or cut through for certain add-on projects and is even removable so that a customized top can be made. Commericial models have stainless steel tops and are not easily convertable. 18. Railing - Many models have a metal railing around the sides and rear of the work top to prevent items such as glassware from falling of the work top. 19. Draft Tower and Faucet (Tap) - is where the action is for draft beer drinkers. The draft tower holds the faucet above the work top at a height that allows glassware to fit under to be filled. Inside the tower is the beer line and usually a thin layer of insulation. Learn more about beer side of your draft system. 20. Drip Tray - is placed on the work top below the faucet to collect drippage from the faucets and overflows from glassware as the beer is poured. Most brands come with a plastic removable drip tray that has to be removed and dumped as it fills. The drip tray requires frequent cleaning to eliminate odors and fruit flies. It is easy install a permenantly mounted drip tray that drains spillage away from the work top - learn how. With this overview of your kegerators parts and operation, you should be ready to make the most of your own kegerator - as is or with a variety of improvements.